WHAT IF… Trumps withdraws forces, since ISIS will be out of the way, then, Israel will have the upper hand…. Damascus (TM) – Syrian government troops backed by Russian forces have sent extra troops toward the city of Manbij in coordination with the militia that controls it, a militia spokesman said, as Turkish-backed Syrian rebels said they were preparing to attack it, Reuters reported. The deployment was coordinated with the US-backed militia in Manbij, the spokesman for the Manbij Military Council said. It is part of the wider buildup of forces in the area. “The battle will soon start,” Maj. Youssef Hamoud, spokesman for the National Army, the main Turkish-backed rebel force in the area, told Reuters. President Donald Trump’s plan to withdraw US troops from Syria has triggered alarm among the largely Kurdish-led Syrian Democratic Forces (SDF). They have partnered with Washington in the war against the Islamic State in Iraq and the Levant (ISIL) and now fear the US move will open the way for Turkey to launch a long-threatened attack against them. “The Russian army has restored the Syrian-Russian coordination center to Arima village to the west of Manbij city, after its withdrawal from there a while ago,” said Sharfan Darwish, spokesman for the Manbij Military Council. Manbij was seized in 2016 from ISIL by Syrian militia allied to the SDF, which control roughly a quarter of Syria. Its capture was a milestone in the US-backed campaign against ISIL. In June the United States and Turkey reached an agreement that would see the Syrian Kurdish People’s Protection Units (YPG) militia ousted from the town, but Turkey says its implementation has been delayed. In November Turkish and US troops began joint patrols in the region. Turkey is determined to cross to the east of the Euphrates River in northern Syria as soon as possible, Ankara’s foreign minister was quoted as saying on Tuesday. Ankara regards the YPG as terrorists and has been infuriated by US support for the group in the fight against ISIL. Trump’s abrupt decision to pull troops out of Syria has handed the fight against ISIL over to Turkey — and effectively given Ankara the green light to push into the remaining Kurdish-controlled areas in northern Syria. Don’t get your info from one source. Shame on you if you do:( boooo. Kiev (GPA) – While western media frets over Trump’s withdrawal from Syria, Ukraine is trying to start a war with Russia. While much of the western media is fretting over the decision by US President Donald Trump to withdraw American troops from northern Syria there is another potential conflict brewing. This time, the trouble is, once again, coming from Ukraine, where NATO may end up getting the confrontation with Russia they so desire. Last month, the long-simmering tension between Russia and Ukraine came to a head when Ukrainian Navy ships entered the Sea of Azov heading towards the Kerch Strait. According to Moscow, this was a violation of Russia’s territorial waters and resulted in the Ukrainian ships being stopped by Russian vessels and 24 sailors being detained. Even though this event took place in late November and now it is almost January, the fate of the Ukrainian sailors seems settled with the denial of an appeal by five of the detainees by a Russian court this week. The court decided against the appeal of five of the sailors to end their time in custody and declared that they would be held by Russia until the end of January. In fact, following the last “attack,” Ukraine has done nothing but prepare for a future act of Russian aggression which they say is likely. The initial sign of this attitude was the fact that Ukrainian President Petro Poroshenko declared martial law following the incident in November to prepare the military for potential conflict (which likely didn’t work) and, although he has called it off now, the military is now fully ready for a confrontation. This sentiment was voiced publicly as recently as this past holiday weekend when Vice Admiral Andriy Tarasov, chief of Ukraine’s naval staff told Kyiv post that “There’s a war going on, initiated by Russia…and this war is raging at the sea too, since 2014. Whether we want and don’t want to lay low at bases and offices; we have to fulfill our duties regarding the protection of our sovereign interests. And the sovereign interests of Ukraine apply to the Kerch Strait as well.” Tarasov then went on to warn Russia that, should they attack again his country is “fully entitled by international and Ukrainian law,” to apply the rules of war to the situation as far as military responses go. Moscow, for their part, has called out this dangerous behavior by the military junta that still rules in Kiev since the Euromaidan coup in late 2013. Following these latest threats by Ukraine to respond to an attack that hasn’t happened (and that there are no signs of) Russian officials have rightfully deemed this language as provocative. Foreign Ministry spokeswoman Maria Zakharova said as much on the 24th when she told reporters that based on Kiev’s actions, “it is quite possible” Ukraine “might switch to full-scale combat actions within the next few days.” Most western media, of course, treated Zakharova’s statement as the provocation yet this was at the same time that Kiev had ordered more troops to their border with Russia in preparation for a potential clash. As of right now, Kiev and Moscow are currently in a standoff and it is unclear which side (probably Ukraine) if any, is going to make the first actual military move but the two countries are continuing to fight in the economic sphere (as has always been the case). Russia has already expanded their sanctions on Ukraine freezing the assets of 68 Ukrainian companies and over 300 individuals. There are also elections in Ukraine next year and these further sanctions, on top of the rampant government corruption, are likely to make things hard for Poroshenko who already has lost the support of over 50% of Ukrainians according to some polls. With election prospects like these, Poroshenko may be looking to make a grand gesture to drum up support among voters. While an attack by Ukraine on Russia would presumably need NATO support before going forward, Poroshenko may be getting desperate enough to skip that step. Will We Learn from History — And What Will Soon Be History? The core of hindsight bias is that we believe we understand the past, which implies the future should also be knowable; but in fact we understand the past less than we believe we do – compelling narratives foster an illusion of inevitability; but no such story can include the myriad of events that would have caused a different outcome . Whichever historical echo turns out to be loudest as the Great Monetary Inflation of 2011-18 enters its late dangerous phase. Whether we’re looking at 1927-9, 1930-3, or 1937-8, the story will seem obvious in retrospect, at least according to skilled narrators. There may be competing narratives about these events — even decades into the future, just as there still are today about each of the above mentioned episodes. Even today, the Austrian School, the Keynesians, and the monetarists, all tell very different historical narratives and the weight of evidence has not knocked out any of these competitors in the popular imagination. Speculative feedback loops that are in effect naturally occurring Ponzi schemes do arise from time to time without the contrivance of a fraudulent manager. Even if there is no manipulator fabricating false stories and deliberately deceiving investors in the aggregate stock market, tales about the market are everywhere….. The path of a naturally occurring Ponzi scheme – if we may call speculative bubbles that – will be more irregular and less dramatic since there is no direct manipulation but the path may sometimes resemble that of a Ponzi scheme when it is supported by naturally occurring stories. Bottom line: great asset inflations (although the term “inflation” remains foreign to Shiller!) are populated by “naturally occurring Ponzi schemes,” with the most extreme and blatant including Dutch tulips, Tokyo golf clubs, Iceland credits, and Bitcoins; the less extreme but much more economically important episodes in recent history include financial equities in 2003-6 or the FANMGs in 2015-18; and perhaps the biggest in this cycle could yet be private equity. First, could 2019-21 feature a loud echo of 1926-8 (which in turn had echoes in 1987-9, 1998-9, and 2015-17)? The characteristic of 1926-8 was a “Fed put” in the midst of an incipient cool-down of asset inflation (along with a growth cycle slowdown or even onset of mild recession) which succeeds apparently in igniting a fresh economic rebound and extension/intensification of asset inflation for a while longer (two years or more). In mid-1927 New York Fed Governor Benjamin Strong administered his coup de whiskey to the stock market (and to the German loan boom), notwithstanding the protest of Reichsbank President Schacht). The conditions for such a Fed put to be successful include a still strong current of speculative story telling (the narratives have not yet become tired or even sick); the mal-investment and other forms of over-spending (including types of consumption) must not be on such a huge scale as already going into reverse; and the camouflage of leverage — so much a component of “natural Ponzi schemes” — must not yet be broken. The magicians, otherwise called “financial engineers” still hold power over market attention. Most plausibly we have passed the stage in this cycle where such a further kiss of life could be given to asset inflation. And so we move on to the second possible echo: could this be 1937-8? There are some similarities in background. Several years of massive QE under the Roosevelt Administration (1934-6) (not called such and due ostensibly to the monetization of massive gold inflows to the US) culminated in a stock market and commodity market bubble in 1936, to which the Fed responded by effecting a tiny rise in interest rates while clawing back QE. Under huge political pressure the Fed reversed these measures in early 1937; a weakening stock market seems to reverse. But then came the Crash of late Summer and early Autumn 1937 and the confirmed onset of the Roosevelt recession (roughly mid-1937 to mid-1938). This was even more severe than the 1929-30 downturn. But then there was a rapid re-bound. On further consideration, there are grounds for skepticism about whether the 1937-8 episode will echo loudly in the near future. In 1937 there had been barely three years of economic expansion. Credit bubbles and investment spending bubbles (mal-investment) were hardly to be seen. And the monetary inflation in the US was independent and very different from monetary conditions in Europe, where in fact the parallel economic downturn was very mild if even present. And of course the re-bound had much to do with military re-armament. It is troubling that the third possible echo — that of the Great Depression of 1930-2 — could be the most likely to occur. The Great Depression from a US perspective was two back-to-back recessions; first the severe recession of autumn 1929 to mid-1931; and then the immediate onset of an even more devastating downturn from summer 1931 to summer 1932 (then extended by the huge uncertainty related to the incoming Roosevelt Administration and its gold policy). It was the global credit meltdown — the unwinding of the credit bubble of the 1920s most importantly as regards the giant lending boom into Germany — which triggered that second recession and snuffed out a putative recovery in mid-1931. It is possible to imagine such a two-stage process in the present instance. Equity market tumble accompanies a pull-back of consumer and investment spending in coming quarters. The financial sector and credit quakes come later as collateral values plummet and exposures come into view. In the early 1930s the epicentre of the credit collapse was middle Europe (most of all Germany); today Europe would also be central, but we should also factor in Asia (and of course China in particular). And there is much scenario-building around the topics of ugly political and geo-political developments that could add to the woes of the global downturn. Indeed profound shock developments are well within the normal range of probabilistic vision in the UK, France and Germany — a subject for another day. And such vision should also encompass China. Brendan Brown is the Head of Economic Research at Mitsubishi UFJ Securities International. 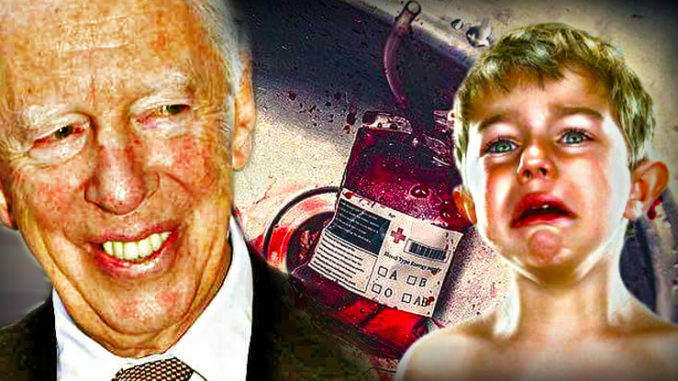 World leaders and elite businessmen are ingesting the blood of young children in order to achieve ‘eternal youth,’ a CBS report warns. What was once dismissed as a ‘conspiracy theory’ is now being publicly acknowledged by billionaires and the mainstream media. 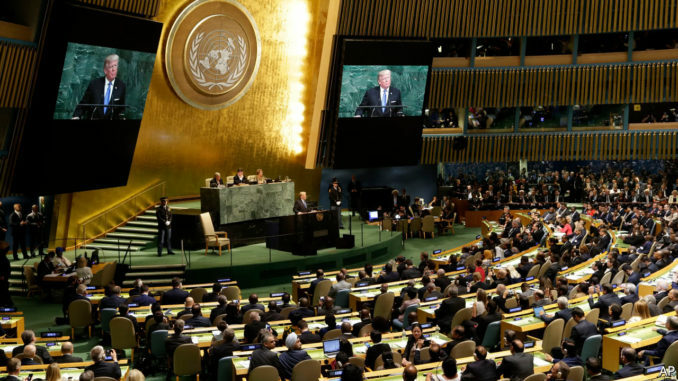 While addressing the UN recently, Trump urged other nations to reject the push for a single globalist government and instead embrace patriotism and sovereignty. In an historic speech earlier this year, Trump highlighted the achievements of his presidency, slamming America’s adversaries and rallying against the elites end goal of a globalist dystopia. “America is governed by Americans,” Trump said. In the 1960s, an informed but naïve undergraduate, I was walking across the campus of the University of Pennsylvania with the Chairman of the Chemistry Department, Prof. Charles C. Price. He told me that he was president of the United World Federalists, and asked if I knew what that organization was. When I said that I did not, he replied that they believed in a one-world government that would grow out of the United Nations. I was nonplussed as I had never heard anyone suggest that idea before. To me, the United Nations was a benevolent organization dedicated to pressuring the world community in the direction of peace, and to operating charitable programs to help the struggling, impoverished peoples of the world. I imagined the UN as a kind of United Way on a worldwide scale. How would Prof. Price’s vision of a new world government emerge? Although there was a socialistic thread in its founding document, the United Nations was formed based on a vision of human rights presented in the “Universal Declaration of Human Rights” (UDHR) which placed the concept of rights at the forefront for the progress of the world body. And rights are the mainstay for uplifting human freedom and the dignity of the individual. The UDHR document followed many amazing documents that presented rights as the central concept of the post-feudal world: the English Declaration (or Bill) of Rights of 1689, the U.S. Declaration of Independence with its important and forceful assertion of inalienable natural rights, the powerful U.S. Bill of Rights enacted in 1791, and the French Declaration of the Rights of Man and the Citizen (1789). The word “rights” appears in almost every sentence of the 1869-word UN document. The document is literally obsessed with rights, and one must assume they are likewise obsessed with the rights successes as manifested in the United Kingdom, the U.S., and France. However, there are some deviations from the rights usage we are all familiar with. In Article 3, Instead of the inalienable rights of “life, liberty, and the pursuit of happiness” found in our Declaration of Independence, the UN declares everyone’s right to “life, liberty and security of person.” Are they implying that security will bring happiness? Or are they implying that happiness is too ephemeral a value, and too Western? Perhaps more mundane survival goals are needed by most of the world. We see a reprise of items from our Bill of Rights such as condemnation of cruel and unusual punishment (Article 5), due process (Articles 6,7,8,9, 10, 11, 14, 17), illegal search and seizure (Article 12), and freedom of speech and assembly (Articles 19,20). But there are new rights introduced which, as early as 1945, were pointing the way towards intervention by the UN in the daily lives of people throughout the world. Throughout the document, they assert the right to food, clothing, medical care, social services, unemployment and disability benefits, child care, and free education, plus the right to “full development of the personality,” (imagine, the UN says I have the right to be me) and the “right freely to participate in the cultural life of the community… and to enjoy the arts” (we each have the right to enjoy a painting or a movie). However, they do not state the right to appear on the “Tonight Show” or “Saturday Night Live”, so there were limits to their largesse. In 2015, seventy years after their original rights-based document, the UN took a giant step towards the global government that was only hinted at in their first organizing document. They issued a document entitled “Transforming Our World: the 2030 Agenda for Sustainable Development.” This document has 91 numbered sections of the UN’s program for world government. The UDHR is only referenced once in the entire document in Article 19. Unlike the original “mother document” that was under 1900 words, this document is 14,883 words. The 91 items are addressing issues under the five headings of People, Planet, Prosperity, Peace, and Partnership. Additionally, the document provides 17 Sustainable Development Goals (SDGs) to improve life on the planet. What is meant by the term “sustainable?” The most often quoted definition comes from the UN World Commission on Environment and Development: “sustainable development is development that meets the needs of the present without compromising the ability of future generations to meet their own needs.” The earlier ideas and ideals of rights, freedom, equality, and justice are subsumed under meeting of needs and an explicit environmentalism which emphasizes preventing the depletion of scarce planetary resources. Of course, the takeoff is the Marxist axiom that society should be organized around the idea of “from each according to his ability to each according to his needs.” Thus, Marxism is implicit in sustainability, but is nuanced by its alliance with seemingly scientific adjustments and goals related to environmentalism. A technical jargon is welded to Marxist intentionality to produce a sense of fittingness and modern progress. The entire “Transforming Our World” document is cast in a stream of consciousness of pious platitudes for a utopian future. It is an outsize utopian dream. Five of the 17 items pertain to the environment. There are goals for the cities, for women, for the poor, and even for life under the water. Absolutely no sphere of human activity is exempt from control by the UN. The key word of course is no longer “rights” except the oblique reference in Article 19. In fact, this writer did not see the word rights even once in this document even though that word appeared in practically every sentence of the original UN document. The sustainability ideal is not wedded to a Christian worldview; instead, individual liberty is submerged in a scientifically determined collectivist mindset with final decisions in the hands of the devilish, all-knowing Big Brothers. The relevance of the individual is downplayed. It is being put forward by a UN that is no longer pro-western, a much larger body than existed in 1945. Will you accept it, or is it time, more than ever before, to begin rethinking our membership in that unsustainable body?